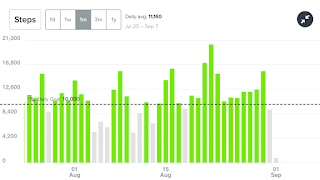 I've been walking lots the last month, trying to stay in shape, but also trying to heal a nagging calf injury. I had a good streak going with the FitBit, but broke that yesterday. This was the last month or so, and as you can see, I've had 12 days of 10,000+ steps. I was planning on getting there yesterday. I had a short walk, and at about 4000 steps in the afternoon, I left to run a bit during Kendall's practice. Unfortunately, there was a thunderstorm, lightning, and some drizzle. I almost walked onto the track, but decided not to and worked instead. When we got done, and after my long, Cardinal Club meeting, I got home at 8:30 with 5k steps. I hit the treadmill for 30 minutes, 2.5mi, but ended up at 9k steps, but stopped there. At least I worked a bit. We'll see if I can stick to this a bit more moving forward.